Duration: 9 days, 8 nights, 7 water days and general touring of the area. 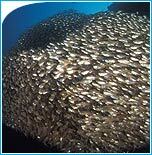 For recreational scuba divers, a 9 day Sardine Run expedition will offer the best possibility of success. This time period will allow for bad weather scenarios and variable degrees of marine activity. Clients wanting to bring their mobile phones along are advised to purchase a VODACOM sim card and not an MTN sim card as there is no MTN reception at Mbotyi. June/ July are winter months on the Wild Coast and wet weather is possible (though not always the case). 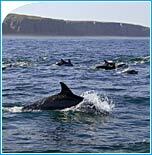 Conditions will vary from glass-like seas to flying through giant rollers in pumping winds - very exciting and sometimes strenuous. Safety is always the priority when on the water and the SEAL skipper will navigate accordingly. Visibility - Varies from 2 - 20m/ 6 ft - 60ft. 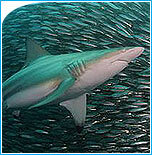 As a safety precaution, we generally don't enter the water in less than 15ft of visibility. Advanced Diver Certification only - divers will be required to present their dive cards and/ or log-books to us upon arrival. 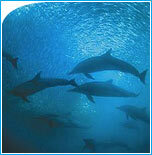 This activity is for experienced scuba divers only. We strongly recommend divers bring their own gear rather than hiring on location. Having gear that you are familiar and comfortable with is important for this type of adventure diving. 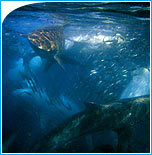 The Indian Ocean is the warmer of the 2 oceans bordering South Africa. We're diving in the winter season where water temperatures will vary between 59 - 70 F/ 15 - 21 C. A 5mm wetsuit will most often suffice with booties, hoody and gloves recommended. 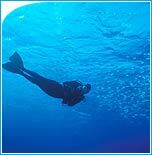 A 7mm semi-dry will be appropriate for divers who get cold easily. 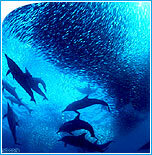 In ideal Sardine Run conditions, the water temperature will be in the range 59 - 65 F.
SEAL staff will be on hand to carry equipment in transit, re-fill tanks etc. Rinse facilities are provided post diving. 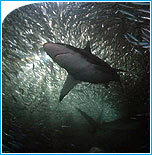 The Sardine Run can be physically challenging and a base fitness level is recommended though not essential. The more fit the participant the more enjoyment of the experience. 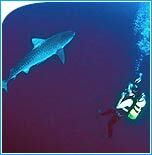 Divers with pre-existing medical conditions must stipulate when signing the expedition waiver documents. 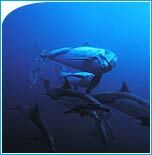 A full medical is recommended for divers with pre-existing health conditions.